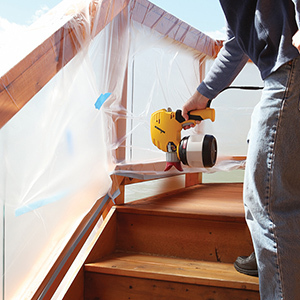 The Wagner airless Power Painter Plus will make less work and faster completion of medium sized outdoor painting and staining projects. 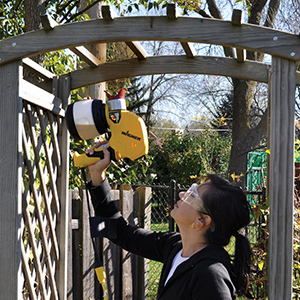 Fences, overhangs, playsets, sheds and furniture are sprayed faster and take less work with the Power Painter Plus. 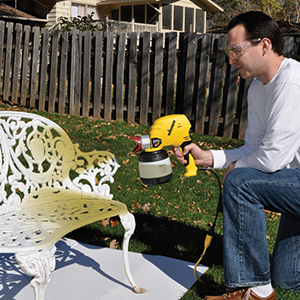 This sprayer can be used at any angle for full coverage and a consistent finish. Power Painter Plus is rated 3.3 out of 5 by 56. Rated 5 out of 5 by Miraclerpo from The power painter pro plus with EZ TILT. I brought this product 2 days ago from Lowe's. And man I must say wow. It really gets the job done, 377sq ft ceiling done with in 41 mins. However my product didnt come with the carrying bag. Rated 4 out of 5 by Crazy Johnny from Cleaning issues Work last great when it’s clean. Hard to keep clean. Rated 1 out of 5 by POJason from Dont Buy, waste of money I bought this on 4/15/18 to paint a room that i am redoing, high ceilings about 330 sqft of room with a loft build in. I been using a roller this past weekend and killz latex2 in this room on the walls, the reviews i read about this product on lowes web site were ok, i went to the store and asked an employee in paint about this prodect they insured me it would work with what i was using. Even said works with latex paint on the box. So I was sure ill get this. get home follow instructions and yes it works for the first 40 seconds then it stopped spraying and I had to turn of and on again for it to work for another 30 seconds, It sputters too when its not working right even though the canister is full. I took it back today 4/16/18 to lowes and got my money back even after I used it I empty the paint before taking it back, I fished the room at 3 am this morning using a roller. I did like how the sprayer did work, but not with Killz. Rated 1 out of 5 by Irguy from It worked well for 60 seconds I brought my brand new Power Painter Plus to a friend's house to paint his living room. We spent about two hours masking and putting up plastic sheeting to control the overspray. When we were ready to paint we unboxed the sprayer and went through the instructions step by step. We disassembled the unit as we went through the cleaning procedure and identified each part that we would need to clean. After getting familiar with the unit we filled it with Glidden Diamond interior latex and began spraying the ceiling. The sprayer worked flawlessly for about 60 seconds, maybe less - enough to spray a 2' x 6' section. Then it stopped spraying. We cleaned it twice, thinned the paint with Floetrol, all to no avail. It simply wouldn't spray. We ended up rolling the ceiling and walls - which ironically took less time than prepping to spray and fussing with the sprayer. I returned the unit and am considering whether or not to try another Wagner product. Rated 2 out of 5 by DaleSR from Dissatified customer Starting out painting my basement walls this product worked great BUT shortly after starting the second container the gun stopped spraying had to disassemble and completely clean the unit. the piston was very hard to get out. When starting the second container the gun jammed again. I took it apart and the piston was jammed which I oiled each time. I did this about 5 times before I gave up and returned the Power Painter plus. Now considering buying the ? another Wagner with separate air unit maybe the Paint Ready Station. Rated 1 out of 5 by bath6678 from No flow control and wasted paint Yes - I am an amateur but I am quite smart and a quick learner. I have several pieces of wicker furniture to paint and using a brush would obviously be very labor intensive and time consuming. The Power Painter Plus is good value and assembly and clean up was not difficult. Instruction booklet was clear and easy to understand. The machine did not clog or spatter, except at the end when paint was getting too low. It is impossible to see when the paint level is too low as you can hardly see the paint in the cup and so there is no way of knowing. I found that the overspray was vast. Also. a great deal of paint was used in order to get sufficient coverage. I had to go over pieces with a paint brush afterward to get rid of drips and excess areas of paint. There is no way of controlling paint flow. I can accept the loud noise that the machine makes but the overspray and lack of paint flow is a big problem. No, I would never recommend this product. Regret the purchase. It can be used with oil paints that use mineral spirits for clean up. FLAMMABLE oil based materials that need solvents to clean up will damage the sprayer. For further information give us a call at 800-328-8251.Thanks for your inquiry, have a great day! By using part #0518361, extension tube, you can draw paint directly from the can. Give us a call to place an order for the extension tubing or the cup you have lost at 800-328-8251. I haven&rsquo;t started using it yet because I&rsquo;m not sure it can be used on interior paint or latex paint. After reading all the comments I&rsquo;m skeptical. It seems everyone says don&rsquo;t try it. Not sure what that had to do with prepping the area. Yes or no yo using it on latex or interior paints? Will your sprayers work with rustolum paint ? Yes, any water based or oil based paint, stain or finish is just fine. Cleanup with water or mineral spirits. What type of oil can I buy for lubrication? We recommend using 3 in 1 oil or any similar type. 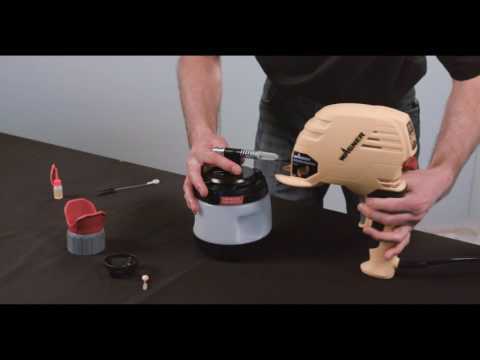 Can I spray poly acrylic or polyurethane in the Power Painter Plus? You can spray it as long as it is water based or oil based. 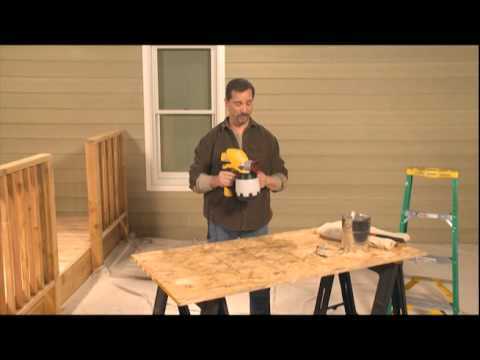 Generally you would be expecting a &quot;fine&quot; finish when using polyurethane. The Power Painter is not a fine finish sprayer. We do have better systems for a fine finish. Give us a call at 800-328-8251. I have the Power Painter Plus &amp; need a larger container for holding paint for a large barn project. Will the remote suction hose work for what I'm looking for? Will it pull paint right out of the can? You're exactly right. The remote suction set is what you need. 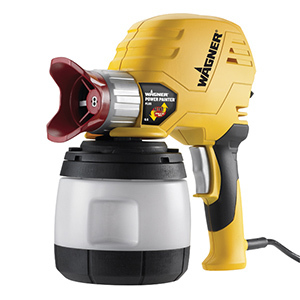 It will draw paint directly from the can and connect right to your Power Painter Plus. Does Wagner sell a remote suction hose for the Power Painter Plus EZ Tilt longer than 5 ft and a can cover for five gallon buckets?